Shohé Tanaka was born on 12 June, 1862, in Yahata village, at the vicinity of Minamiawadji, now a town in Mihara District, Awaji Province, Japan. As a child, he demonstrated a good ear for music, and was fond of ningyo joruri (Japanese puppet theatre in which recited narrative and dialog is accompanied by a shamisen). He also collected insects and arranged imaginary competitions between them, according to the sounds they issued. In 1874 Tanaka enrolled the Foreign Languages School in Osaka, but soon he moved to the English Language School in Tokyo. In 1877 he enrolled the School of Foreign Studies in Tokyo, and in 1878 the Natural Sciences Faculty of Tokyo Imperial University. His fellow-students were the famous Japanese scientists Tanakadate Aikitsu, and Rikitaro Fujisawa. At this time a visiting professor of physics at Tokyo Imperial University was Thomas Corwin Mendenhall (1841–1924), an American autodidact physicist and meteorologist. Mendenhall was convinced that understanding music is a prerequisite for the successful study of physics, and in the physics room in this connection there was a small organ to which Tanaka had direct access. Moreover, Mendenhall postulated that Western European music was built in accordance with the laws of nature, which was followed by the "unnaturalness" of Japanese music, which contradicted Tanaka's intuitions and stimulated the beginning of his research in this field. It was Mendenhall who introduced Tanaka to the notion of the just intonation: on Saturdays he used to invite students to his home, played them on the violin and laid out the foundations of the theory of music. 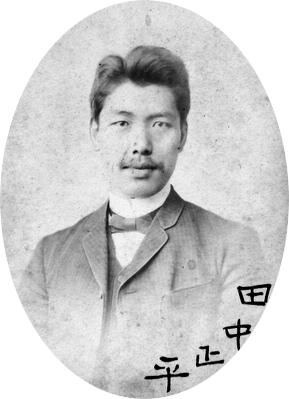 In 1882, Tanaka graduated from the University (Department of Physics), becoming the youngest at that time graduate in the history of the University. At the ceremony of awarding diplomas, Tanaka received from the hands of the Emperor a silver medal for his academic achievements. Since December of the following year, he started working as an assistant lecturer, defending the appropriate qualification work. 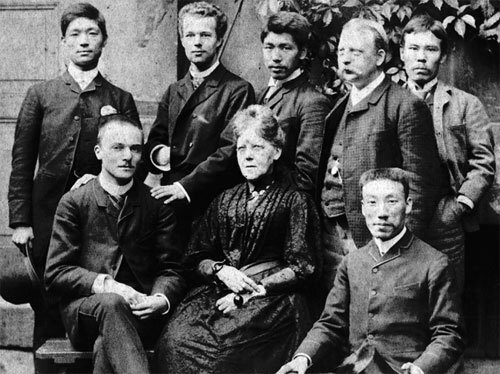 In 1884, after receiving the Imperial Scholarship, Tanaka was sent together with other young scientists and intellectuals (including Mori Ogai, the prominent Japanese army surgeon, translator, and novelist, whose "German diary" kept records of Tanaka) to Berlin, for research in the fields of musical acoustics and electromagnetism, which he defined for himself as priority. The scholarship was for a three-year stay in Germany, but in the end, Tanaka spent fifteen years there. At the University of Berlin Tanaka began to work under the guidance of the prominent German physicist Hermann Helmholtz. Throughout his stay in Germany, Tanaka intensively studied the European music. In Berlin he studied piano and sang in a choir. In addition, he studied harmony, musical form, and counterpoint. In 1890, Tanaka published his primary work on musical acoustics "Studien im Gebiete der reinen Stimmung." Tanaka also designed and patented a just intonation Enharmonium (enharmonic+harmonium) with 20 keys and 26 pitches in an octave. The Enharmonium was demonstrated with great success to the public, including the German Emperor and Empress in April, 1890. During the last years of his stay in Germany (for the last five years he had voluntarily stayed in Germany at his own expense, as it was inappropriate for the state to finance its activities that took a different direction from the one for which this financing was originally funded), Tanaka departed from musical acoustics and in the period from 1894 to 1899 he conducted intensive research in the field of engineering with a specialization in railway transport. In this period he obtained also several patents for calculating machines (see adding machines of Tanaka). In 1899, Tanaka returned to Japan and joined the company Japan Railways. In 1907, he went to work at the Imperial Railroad Administration under the Ministry of Railway Transport, in 1909—as a representative of the inspection at the Office, and in 1911—as its head. In 1913, Tanaka left the leading post and switched to part-time employment, combining it with work in the Ministry of Culture and Education (since 1921 he was a member of the Committee on Japanese Music), as well as leading the music society "Pure Sound", which he created in 1907. In October, 1908, Shohé Tanaka married to Take Yamanaka, a relative of his friend and fellow-student— Mori Ogai. Shohé Tanaka is considered one of the founders of modern Japanese musicology. After his retirement in 1929, he resumed his studies of the just intonation and conducted active research and organizational musical activity until his death. He also led the Institute of Electrical Engineering, established by him in 1930, for which in 1937 he was awarded the Asahi Prize in the field of culture. In the last years of his life, Tanaka also worked in the "Institute for the Study of Folk Spiritual Culture", created in the war years for ideological purposes, where he studied the preservation of traditional Japanese music. During the World War II Shohé Tanaka was evacuated in Shibayama, now a town in Sanbu District, Chiba Prefecture, Japan. He died there on 16 October, 1945.